In the Orthodox Church we say that “we are lost alone but are saved together.” I’ve come to understand and appreciate what this “together” means. 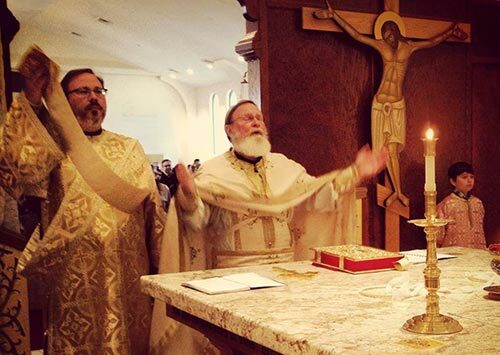 In the Orthodox faith it’s not just “me and Jesus,” not just an enumeration of sins and merits that cancel each other, but a living community, the Church, entirely fulfilled when and where the priest imparts the Eucharist to a body of believers, under the authority of a bishop. In this community, we work out our salvation together. Each member of the local body can contribute through diligent efforts not only to his or her own salvation, but also to the salvation of others. In a more general sense, this can be extended to the whole humanity. We are persons living in relationships with other persons, not isolated individuals living in a solipsistic world. Through such relationships we help or hinder, we heal or hurt, we save or destroy. The organic unity of mankind is not only a theological concept, but also a scientific fact. Let’s consider some modern ideas that point to it. Perhaps we all had those strange experiences of discovering common acquaintances with somebody that we have just met, sometimes through convoluted or far-fetched connections. In such situations we exclaim: It’s a small world! From a formal point of view, the small world concept refers to the fact that most of the people in the world are connected through a small number of steps. Is there some fisherman in Kamchatka? I have a good Russian friend in Sankt Petersburg who did his military service there. There is a good chance that through less then four or five connections I can reach that fisherman. If we measure the degree of separation between people, we discovered that everybody is connected with everybody else through a surprisingly small number of steps. There was a popular belief for a while that the magic number that expresses the average degrees of separation is six, whence the expression “six degrees of separation.” While in United States the number is about right, it seems that if we take the whole humanity in account the number is slightly larger, perhaps somewhere around ten. Social networks tend to create this huge interconnectivity, as a result of man’s nature and inclination to live and work and cooperate with others. Here is one of many examples: I am member in an online professional network that helps people keep in touch with former colleagues or business partners. On this network I have 118 direct contacts, most of them people that I have met during almost 30 years of my career. All these are at one degree of separation from me. The web site allows me to see the number of people with whom I am connected at higher degrees of separation. The ones at two degrees of separation, people who know my acquaintances, form an impressing number: 56,100. At four degrees of separation, I’m connected with no less then 3,171,100 people! Without being a “well-connected” person, I have discovered a number of interesting connections in my life. One of my favorite writers is the Argentinean Jorge Luis Borges, author of a series of amazing short stories and Nobel Prize laureate. I used to read his stories, some of them two or three times. Sometime in 1995 I worked on a project with a professor of Computer Science of Argentinean origin, who told me that he has met Borges many years before. At that moment I could claim that there were just two degrees of separation between this great writer and myself. Although I’m working now as a software engineer, my college degree is in Mathematics, in which I continue to be interested. Many years ago I read about a great Russian mathematician, Yuri Matisievich. He is and will remain famous in the history of Mathematics as the one who solved one of the most difficult problems launched as a challenge by another famous mathematician, David Hilbert, who lived at the end of the nineteenth century. Reading about the problem and about Yuri Matisievich, I happened to notice that he was from St. Petersburg, Russia. As I happened to travel there, I asked one of my friends, Professor Andrei Terekhov, if he heard about this great mathematician. He responded, “Not only that I’ve heard of him, we are good friends.” I solicited Andrei to help me meet him. He arranged for a dinner together, and here I was, at the same table with the man famous in the history of mathematics. Here is a more interesting one, this time with a saint of the Orthodox Church, St. Silouan. He was a Russian soldier who gave up his military career to become a monk, and went to Mount Athos, where he spent the rest of his life. Never a famous person during his lifetime, he became well know only years after his death, due to one of his spiritual children, later known as Archimandrite Sophrony. After spending a number of years at Mt. Athos, Father Sophrony returned to Western Europe, where he published a number of books about the life and teaching of his spiritual father, and later started a monastery in England. Father Sophrony had himself a number of spiritual children, to whom he passed the teachings of St. Silouan. One of these was a Romanian monk, Rafail Noica. He was the child of a Romanian philosopher and an English mother. His parents separated when he was young, and knowing that England offers better hopes for the future, his father allowed him to go there with his mother, who happened to be a Baptist. He grew in the Baptist faith, until later he discover Orthodoxy, converted and became a monk. After the fall of Communism he came to Romania and became a hermit, living alone for a number of years somewhere in the Western Carpathians, in Transylvania. As many other people in that situation, he later returned in the world and became a teacher and spiritual father to many young people. He was invited to speak everywhere in the country, in particular to Alba Iulia, my hometown. Archbishop Andrei of Alba Iulia invited him there many times, and I’m sure they know each other very well. I met Archbishop Andrei for the first time in 2000, when I was investigating the Orthodox faith. I went to the Episcopal building next to the cathedral, looking for somebody to talk about Orthodoxy, and to my surprise I was pushed into his office and I was able to have a good discussion with him. Since that time, I have met him a number of times while visiting Romania. Here is then the connection: Saint Silouan – Archimandrite Sophronie – Rafail Noica – Archbishop Andrei – myself. I am therefore just four degrees removed from Saint Silouan. I am sure that there are millions whose lives were touched by this saint, perhaps many much closer to him not only by degrees of separation, but also in the way in which they follow his example of a life with Christ. We may find the small world phenomenon everywhere, even in the Bible. In Philippians 4:22, Apostle Paul sends greetings to those in Caesar’s household. It took just a few years for the Gospel of Him who was crucified by the Romans to reach the household of the man who was at the head of the Roman Empire. As Apostle Paul apparently knew these people, who in turn may have met the Roman emperor, being members of his household as servants or slaves, it looks like there were just three degrees of separation, humanly speaking, between Lord Jesus and the Roman Emperor. This extraordinary connectness of humanity has some interesting corollaries. The good or the bad things in our lives can easily pass to others, through hidden and mysterious ways that are beyond our knowledge, imagination or control. They follow unexpected chains of human relationships, reaching all the corners of the world. Just as in modern quantum mechanics every small particle has an effect on the whole material universe, so every act, every gesture, every attitude will influence humanity through an indeterminate number of ever extending ripples. Every act of hate may damage not only its intended target, but also the souls of many others, bringing pain and suffering to a multitude of people. Every act of love may bring comfort and blessing not only to its recipient, but also to scores of others who witness it. In an act of love there is always a Giver, a Receiver, and sometimes a Witness. Clinical studies have discovered that the Receiver has a somatic reaction to the act of the Giver, in that his body releases a “feel good” hormone, which is experienced as peace, satisfaction and well being. It is strange, but the same hormone is also released in the body of the Giver, who thus also benefits from his act of love. Even stranger, it was found that the same thing happens to the Witness, who experiences the same wonderful feeling that life is good and meaningful. This experience is a strong incentive for both the Receiver and the Witness to repeat it, in similar acts of love shown to others. In a small world, this ripple effect may spread fast to all corners of the world. Nowhere is this more obvious then in the case of natural or spiritual parents and children. This may be a blessing and a tragedy. Children of alcoholics have a greater probability to become alcoholics and children from broken families have a greater propensity to end up with broken families. Sins and virtues tend to continue over many generations. Curses are passed and blessings are inherited. I owe so much to my parents, not only for their effort and sacrifices, but also for the good things they passed to me, which form a wealth more precious then properties and bank accounts. I feel at the same time the responsibility and burden to pass these to my children in such a way that they will in turn also pass them to their children. “Children’s children are the crown of old men,” says Proverbs 17:6. The durability and resilience of the values is proven only when they survive at least two generations. The capacity of human networks to efficiently carry a message, a teaching or a way of life is a great opportunity for the Gospel. Christ has commissioned his apostles to go in the world and make disciples, baptizing them in His Name. Apostle Paul is exhorting Timothy in 2 Timothy 2:2: “And the things that thou hast heard of me among many witnesses, the same commit thou to faithful men, who shall be able to teach others also.” We see in his exhortation at least four spiritual generations: Paul, Timothy, “faithful men” and “others”. We have the Tradition of the Church, which is passed from generation to generation not so much through writings, but through the lives of the faithful believers. Thus we are judged by God not only for personal sins or personal holiness, but also for the influence we have on others. If those to whom we give a cup of water learn to give a cup of water, the reward is even greater. If those we offend learn to offend, the judgment will be even harsher. How far does this chain of good or evil go? We do not know. We may be completely ignorant of the effects we have created. We may leave this world thinking that our responsibility is finished, but generations after generations may continue and amplify what we have started during our journey through this world. It is only at the Last Judgment when all will be known, when all will be discovered. “For nothing is secret, that shall not be made manifest; neither any thing hid, that shall not be known and come abroad.” (Luke 9:17). We have a beautiful tradition among the orthodox to offer koliva in memory of a departed family member. As many other symbols in the Orthodox Church, koliva has a multitude of meanings. The wheat seeds symbolize the hope for life and resurrection. But koliva is also a gift to the living, a gesture that continues the goodness of the departed even after their death. We are good to others because the departed person was good to us, and we feel we want to tell about this goodness and pass it to others. Thus we can amplify the good that we have received from others, adding to their reward, and we can stop the evil they may have done, calling God’s mercy over them. Others may do the same for us. In the family and church we work out our salvation together, in a living community of faith and love. While many are lost alone, we are saved together.